Risotto, from scratch, in 30 minutes? Totally possible. Ditto a Vietnamese lemongrass-spiked pork noodle salad, or a elegant steamed snapper with pickled turmeric dish. Three top chefs share their secrets for super-charging a weekend night dinner in no time at all, with no compromises and no cheats. Hamish Ingham, owner-chef of Bar H in Surry Hills and soon to be opened Banksii, in Barangaroo, uses interesting, nutrient-packed ingredients for equal parts flavour and health benefits. "Pickled turmeric is my new obsession; it aids digestion and really gets your taste buds going, with this beautiful acidity," he says. 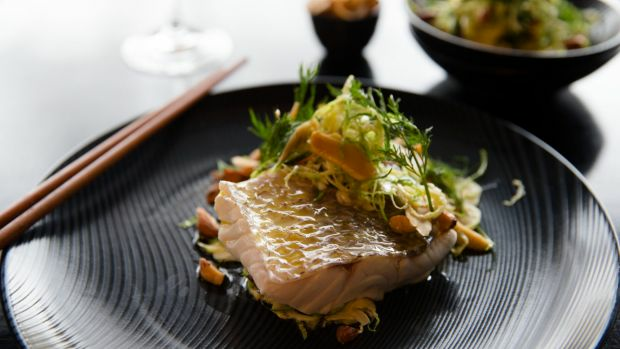 It jazzes up a simple piece of steamed snapper (cooked in a bamboo steamer for a matter of minutes), and will also grace a grilled prawn with curry leaf butter dish at Banksii, when it opens in early October. "Make a big batch of the turmeric pickle [see recipe below] and it will last for months in the fridge. I put it on everything for the slightly gingery heat. It works beautifully with the butter prawns." To complete the dish, shave some raw brussels sprouts into a salad, or add a few stems of broccolini or kalettes – the fancy hybrid of a brussels sprout and kale – into the steamer. 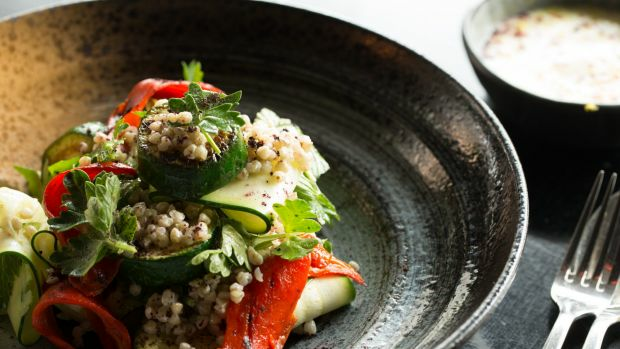 For simple salads, sub out brown rice or quinoa with buckwheat, a quicker-cooking grain that Ingham always incorporates into the menus of Bar H.
"I love the texture of it; the grain is a little bigger," he says. "This zucchini buckwheat salad [recipe below] is something we have at home a lot; raw and cooked zucchini, plenty of spice, and herbs, so it's all freshness and lightness." Little tweaks, such as blackening and peeling a fresh chilli to deepen the flavour, and switching regular flat leaf parsley for native sea parsley, and pepper for a fruitier native pepper berry (Australia's version of szechuan pepper, Ingham says), also add layers of flavour that elevate a simple meal to chef territory. Sustainability super-star Matt Stone shakes pans at the critically-acclaimed fine dining restaurant Oakridge Winery in Coldstream, but first made his mark at the zero-waste Melbourne restaurant Brothl (now closed). Like Ingham, he uses tricks, such as fermentation or pickling, that have a two-fold effect on boosting health but reducing cooking time. The tagline of his just-released cookbook tagline is "Maximum Taste, Zero Waste", so it's unsurprising that his first time is to look at what's lurking in your fridge for inspiration. "Saving and using leftovers is a huge help – you want to invest in quality storage containers to preserve the life of your food," he says. "If not glass, then a friendly plastic, preferably plant based, but no dodgy Chinese takeaway containers." Leftover bits of roast chicken or other meals, plus salad greens, roast vegetables or grains, such as quinoa or rice may not be enough to feed the family for a second time, but they can provide a flavour base to pad out. Stone is particularly fond of healthful broths, that just need a handful of shredded chicken, a few greens and fresh herbs to form a complete meal. The trick is to work steps into your nightly routine to reduce the actual cooking time the next day. "Roast chicken is often a Sunday night thing – once you've taken the flesh off, put the carcass in a pot with leftover vegetable scraps and a few herbs and let it simmer while you're eating dinner," he suggests. "Then the next day, you have a nice stock that can be turned into a soup or a risotto." Whack some brown rice in water overnight, or for a few days, to speed things up even more. "It will cut cooking time down by half, and the biofermentation process adds health benefits – the lactic bacteria kicks off which helps the body absorb maximum fibre and nutrients." So, risotto in 15 minutes? It is possible. ''Use that chicken broth you have, then add in a bunch of garden greens, beetroot tops and grate in a some nice cheese for a quick, tasty meal." Root vegies won't roast in less than half an hour, but shave them on a mandolin and they'll cook quickly and retain flavour. "Shave a parsnip down, saute it with butter and then use a hand blender to make a silky puree in less than 10 minutes, or thin it down a little further with stock and you'll have a lovely creamy soup. On the side, a good cheese toastie is always a banger, and will make it more of a meal." If you're going for a straight stock, bulked up with leftover meat and veg, turn to fresh herbs for the fastest flavour hit. "Chilli, parsley and coriander livens anything up," Stone says. Dan Hong, the whiz-kid executive chef behind Merivale's Sydney venues Mr Wong's, Ms G's and El Loco is also a fan of utilising leftovers, particularly if they come in a doggy bag. "On my days off, we always eat out, so there's always leftover fried rice or something in the fridge. My kids refuse to eat more breakfast-like cereal or toast – they only like Asian food – so my wife gets the frying pan and puts some butter in there, cooks an egg off, adds the rice and some vegetables, a dash of kecap manis and it's a meal," he says. "There are lots of quick ways of doing things. Meat is always better marinated. When you get home from the shops, whack a quick marinade on it before you put in the fridge, and then it's ready to go whenever you need it." Hong suggests using a base of half sugar and half fish or soy sauce, and then adding a couple of flavours such as grated garlic, chilli or lemongrass, and a touch of sesame oil. 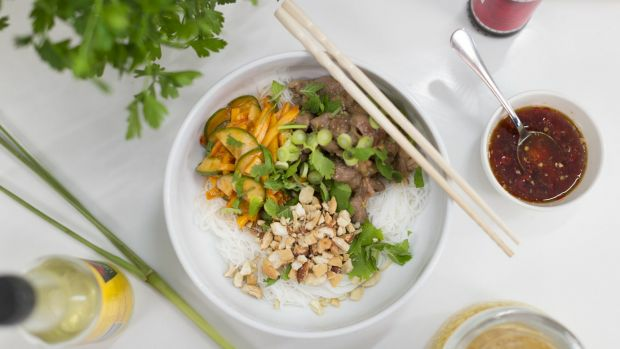 Then when you get home after on the tools or bashing the keyboard, pour boiling water over some rice noodles, fry off the meat and chop some fresh vegetables for a speedy salad. The dressing will take you less than a minute, and even that can be prepared en masse and kept in the fridge, too. One third each of soy or fish sauce, water, sugar and acid, such as a vinegar, lemon or lime juice, is all you need. Want to get fancy? You can replace the flavours of kim chi pretty quickly too, Hong says. Mix it with sliced apple to pimp out that salad, or mix with a base condiment, such as soy or fish sauce, as a dressing for meat. Kit out your kitchen with non-perishables, he suggests. Tofu keeps well in the fridge and can sub in for meat, most sauces can form a flavour and a base starch makes everything else achievable. "It's important to have rice, pasta or noodles, and go from there. Get your pantry in order and everything becomes easier." Thinly slice the pork neck and thinly chop lemongrass. To marinate place pork in a bowl and add lemongrass, 1 tsp of garlic, 1 tsp of sugar and 1 tbsp of fish sauce. Stir to combine and leave for 30 minutes to marinate (if possible). In a separate bowl, add 1 tsp of gochujang, a dash of fish sauce, vinegar, and sesame oil, 1 tsp of garlic, 1 tsp of sugar to create apple kimchi sauce. Stir to combine and place to one side. To create nuoc cham dressing, add equal parts water, sugar, vinegar and fish sauce to a bowl. Taste and adjust flavours as required. Add chilli and ginger for more flavour if desired. Put water in a pot and bring to the boil. Add rice vermicelli to water and cook for about two minutes. Drain and put in a bowl. Julienne apples and cucumber. Add to kimchi sauce. Place oil and marinated pork in hot pan or wok. Leave to cook for about two minutes before moving (to not sweat meat), cook for an additional three minutes. Chop shallots and coriander roughly. Crush nuts. To assemble, place vermicelli in bowl. Add pork, apple kimchi, garnish and nuts onto of noodles. When ready to eat, add desired amount of Nuoc Cham dressing. Mix everything together and tuck in. Serves two. Recipe and image courtesy of ABC TV's Shelfie with Dan Hong. To make the turmeric pickle, in a small saucepan bring the sugar and vinegar to the boil, peel and slice the turmeric on a mandolin as fine as you can, place in a bowl and pour the hot vinegar sugar mix over (best to do this the day before). Mix extra virgin olive oil, mustard and lemon juice in a bowl to combine. Slice the brussels sprouts on a mandolin, place in a mixing bowl, add pickled turmeric and roasted nuts, picked dill and then dressing, mix all to combine. For the snapper, season with olive oil and place on a side plate or baking paper with holes punched through and then into a steamer. Cook for about six minutes or until just cooked through place on a serving dish topped with salad serve immediately. To cook the buckwheat bring one litre of salted water to the boil. Once boiling place the buckwheat into the water and cook until tender, about five minutes, strain and let cool spread out on a tray. Cut two of the zucchini into one-centimetre rounds, season with oil, salt and pepper and lightly panfry until each side is golden brown Set aside. Slice the remaining zucchini into thin strips on a mandolin. For the red chilli place on a wire rack over a direct flame and char until the skin is blackened, remove and peel and deseed and slice in half lengthways. Place the yoghurt in a mixing bowl season with the juice and zest of the lemon, whisk in the olive oil and season with salt and pepper. To make the salad carefully mix all the ingredients in a bowl and transfer to your desired serving plate serve immediately. This is a really quick recipe for breakfast, lunch or dinner. The spinach can be replaced with any leafy green and if you don't have any fresh herbs you can just use a few more greens. My version of Sriracha sauce only has a few ingredients, but the depth of flavour comes from the fermenting of the chilli. Use it as you would Sriracha – that is on a lot of things and particularly leftover pork-belly sandwiches. For the hot sauce, place the chilli paste, garlic and honey in a jug-style blender. Start the blender and gradually increase the speed. Slowly pour in the oil, season to taste with salt and you're good. This sauce will keep for weeks in the fridge. If it sits dormant for a while, the ingredients might start to separate a bit – just give it a good shake and it will come back to life. Place a saucepan over medium heat. Add a splash of water and the spinach. Cook until just wilted and drain in a sieve. Once cool, squeeze as much water out of the spinach as possible and give it a rough chop. To make the pancake batter, sift the flour and baking powder into a mixing bowl. Add the egg yolks, the milk, butter, spices and a large pinch of salt. Mix until smooth. Add the spinach, herbs and spring onion and mix well. Whisk the egg whites until soft peaks form and carefully fold them in to the mixture. Place a heavy-based frying pan over medium heat and add a splash of olive oil. Spoon in about two tablespoons of the batter and press down to a round pancake about one centimetre thick. Add as many as you can fit in the pan while still leaving some space between them. Cook for about two minutes until small bubbles start popping up, give them a flip and cook for another two minutes. Once cooked, remove the pancakes from the pan, place on paper towel and cover with a tea towel (dish towel) to keep warm. Add a little more oil to the pan and continue cooking the pancakes until all the batter is used. Dress the salad leaves with a little olive oil and season with salt. 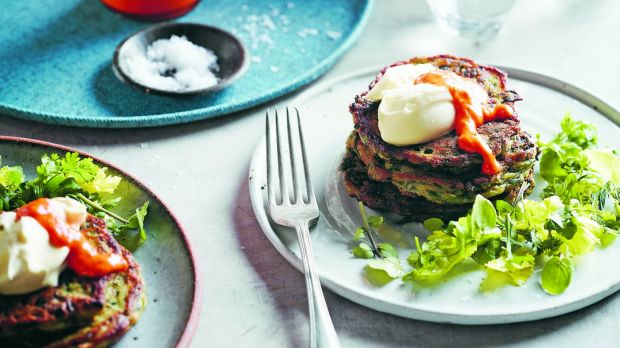 Serve the pancakes with dollops of sour cream and hot sauce on top and the fresh green salad on the side. Serves two. This is exactly the kind of dish you want to put on the backyard table when the sun's out and tomatoes are at their best. Scrub the mussels and remove the hairy beardy bits. Discard any broken mussels, or open ones that don't close when tapped on the bench. Rinse well. Pour the broth into a large saucepan or stockpot and place over high heat. Bring to just under a boil, turn off the heat and let the broth sit. Place another large saucepan over high heat. Once the empty pan is smoking hot, add a small splash of oil. Add the mussels and stir for about 30 seconds. Add the vegetables, garlic and white wine. Once the wine has boiled, place the lid on the pan and cook for two minutes. The mussels will start to pop open. Pour over the hot broth and bring to the boil. By this stage all of the mussels should be open and cooked (you can prise open any that remain closed; they will be fine to eat unless they smell bad). Taste for seasoning – mussels are naturally salty so you might not need to add any extra salt. 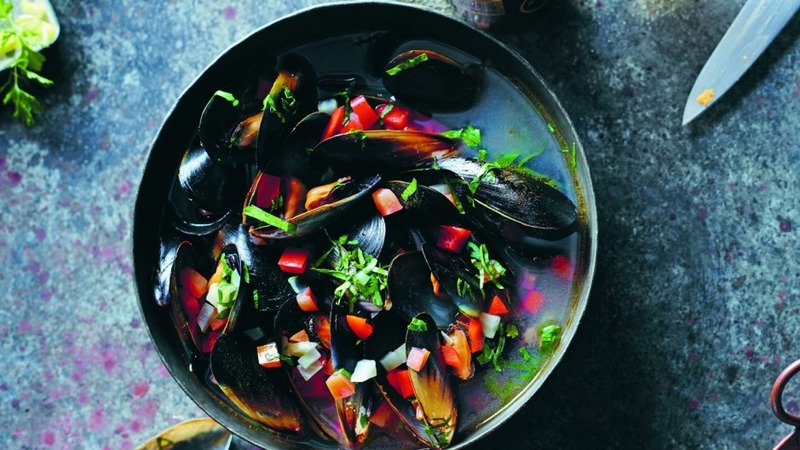 Ladle the mussels and broth into healthy-sized bowls and sprinkle generously with the parsley. Serve with crusty bread and a big glass of rose. Nothing will warm you up quicker on a cold winter's day than a steaming bowl of parsnip and cauliflower soup. It's a perfect make-ahead meal to reheat for a snack or light lunch. Pair with a delicious cheese toasty and dinner is ready. Be sure to make extra toasties because one is never enough. But then I love grilled cheese! Cut the dark green top off the leek, put in the compost or discard (the light green bit is fine to use). Split the leek lengthways and give it a good wash – dirt loves to get inside those leeky layers. Cut into quarters lengthways, then cut into one-centimetre dice. Heat a heavy-based saucepan over medium–high heat, and add the butter and olive oil. Once the butter has melted, add the onion and cook for two minutes, stirring often. Add the leek and continue stirring for two minutes. Add the garlic, parsnips and a large pinch of salt and cook for another five minutes. Add 1.5 litres of the broth and bring to the boil. While you're waiting for the broth to come to the boil, remove the cauliflower florets from their core and cut them roughly into 2½-centimetre pieces. When the broth is boiling, turn the heat down and let it simmer for about 10 minutes. Add the cauliflower. The broth needs to be about two centimetres above the vegetables. Add more broth if needed and bring back to the boil. Reduce the heat to a high simmer and cook for a further 10 minutes or until the vegetables are soft. Turn the heat off and let it sit for about 10 minutes to cool a little before blending. A hand-held stick blender is good to use here (and saves on washing up) or you could use a standard blender and blitz the soup in a couple of batches. Whatever your choice of weapon, you'll need to blend the soup on a high speed for at least one minute until silky and smooth. Taste for seasoning and add more salt if needed. Leave the blended soup on a low heat while you move on to the toasties and burnt butter. To make the toasties, thickly slice your bread. Toast on one side under a hot grill (broiler). Once golden, take the bread out and flip over. Spread the uncooked side with some mustard and a thin layer of the fermented cabbage, if using. Cover liberally with grated cheese and grill until golden. To make the burnt butter, bring the butter to the boil in a small saucepan over medium–high heat. Leave the butter bubbling and as it starts to brown, keep scraping the bottom of the saucepan so you mix in all the caramelising brown pieces of goodness. Once the butter is brown and your kitchen is smelling wonderfully nutty, throw in the sage leaves and stand back (they will hiss and spit a bit as they start to fry). Stir for 30 seconds. Stir in a dash of balsamic vinegar and cook for a further 30 seconds, then turn off the heat. 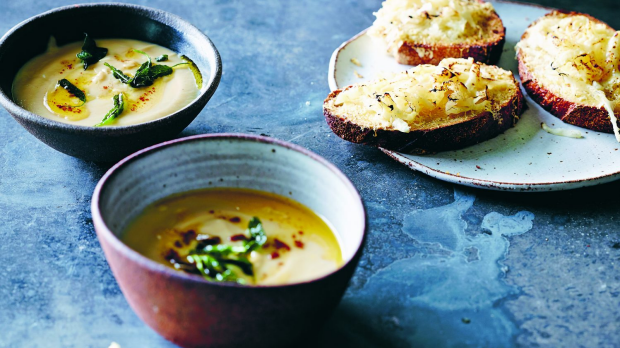 Serve the soup with a generous drizzle of burnt butter and some crispy sage leaves on top, and the cheese toasties on the side. 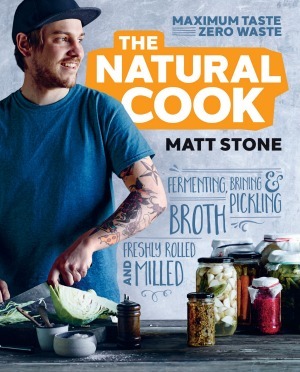 Recipes and images from The Natural Cook by Matt Stone (Murdoch Books).